The time had come! Modern Warfare 3 was released yesterday, eager gamers – queued up to get their copy first lastnight at 12am. Only to find when they returned on that they had a strict nat not an open nat on their Xbox 360 and couldn’t join any online games. We had the same problem, strange though as it often happens with us, not sure if its due to the ip address not being static or the fact something is set up wrong on the router, but set everything up correctly for two Xboxes on the router – anyway I digress. This is what we do, when one of the xboxes have a strict nat – we do this on the xbox – not the router. Follow this video its as easy as pie and takes 5mins – Fix your nat settings for xbox360 this should work, if only for the time being. If you can’t join online games or hear other players in games or chat, you might have a Network Address Translation (NAT) problem. 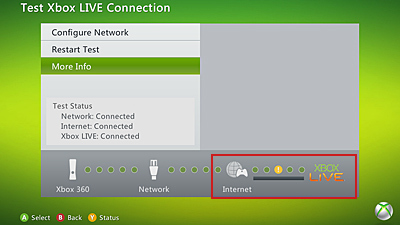 If you have NAT problem, you will see a NAT warning icon when you test your Xbox LIVE connection.